Many institutions seem unwilling to show the U.S. flag its due respect. 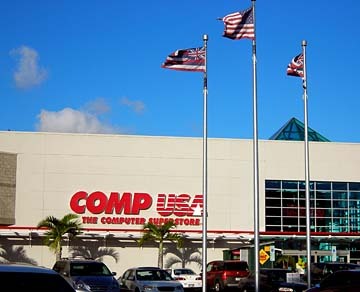 CompUSA properly displays the state and U.S. flags at its Ala Moana Boulevard location. I share retired Air Force Lt. Col. James Burkholder's concern about the (mis)handling of the U.S. flag ("Even children can learn to fold a flag properly," Letters, June 17). I am a former Boy Scouts Cub Master, and we had Cub Scouts performing the flag duties at several local schools with proper procedure and respect. There was one group of Cubs that visited a session of the U.S. Senate to demonstrate the proper recitation of the Pledge of Allegiance to that flag. It seems that our society is losing sight of patriotism and the respect due to the symbol of our great country and the freedoms we all enjoy. The problem at the state Capitol regarding proper handling of the U.S. flag is not the only example. All one has to do is drive around to see other prime examples: bare flag poles at the Department of Transportation, faded and raveled flags at a number of public schools, improperly displayed flags in front of the University of Hawaii John A. Burns School of Medicine. Calls of concern have been made to the office of the medical school dean and to the UH president at Manoa with no responsive action. These calls were made because of a perceived lack of respect (on Memorial Day and Flag Day) for those people who have served this nation under that flag, and particularly those who have given the ultimate sacrifice for what it stands for, evidenced by the numerous properly displayed flags at Punchbowl and Kaneohe veterans cemeteries on Memorial Day. In contrast, as you drive around you will notice proper displays at McDonald's, CompUSA, Aloha Tower Market Place and many others. Is it too much to ask that our governing bodies take a little more pride? Ask anyone on Oahu, "Should the remaining open beachfronts on Oahu be used for multimillion dollar homes?" I would guess the majority would say, "No." The Kahuku villagers in Phase 5 are being asked by Continental Pacific to accept the development of 18 lots on the oceanside of the Kahuku Golf Course. In exchange, we would be able to purchase our homes and lots for an average price of $75,000. Who in the village, having waited 30-some-odd years to buy a home in Kahuku, would say "no" to this? Who in the village would deny their friends and neighbors this opportunity? The problem is, if we agree to this proposal we might get what we dreamed of, but we will be signing away dignity and self-respect. I tend to agree with Barbara Jessee of Ewa Beach (Letters, June 8); people like the sounds and smells of chickens. Please allow me to add that chickens, whether feral or backyard, are proven to be the most effective method of pest control for bugs without the use of deadly pesticides. Not only do they work seven days a week, they never complain about working conditions, don't require union wages, vacations or retirement benefits, and are always early to work. On June 14, at approximately 2 p.m., two women were jaywalking midblock on Maunakea Street between Beretania and Kukui streets. They were stopped by two police officers. After ascertaining the women did not speak English, the officers let them go. Lesson to be learned: If you are stopped for jaywalking and pretend not to speak English, you, too, may get off scot-free. I'd like to applaud Castle & Cooke for its leadership in renewable energy projects on Lanai. A world-class solar energy farm and wind energy farm in Hawaii are just amazing. This is more than just lip service on renewable energy. This could put us at the forefront of sustainable technology to lead the nation and world. I've always thought that there is no better place than Hawaii to showcase clean energy research and industry. And we all benefit from lowering our dependence on oil, reducing greenhouse emissions and the boost to our economy from research and industry. Thank you, Castle & Cooke, for believing and investing in Hawaii, and putting us at the forefront of sustainability. I love the June 1 Star-Bulletin article by Nina Wu about Kewalo Basin. What we have here is two bookends at each end of Ala Moana Park that are in such disarray that calling it a garbage dump would be kind. The Hawaii Community Development Authority has at least proved it has the talent and future in mind to solve the problems. I normally do not go against boaters, but this is not about boaters; it is a matter of Kewalo Basin and about 1.2 million other people in Hawaii who would love to use the property. In Hawaii, harbors belong to the state, which is all the people, some of whom would rather see something else there. Ala Wai and Kewalo are plain and simple the worst of the worst of any harbors anywhere in the state. Boaters want the harbors fixed up, but they do not want to pay for the improvements, and that's what has been wrong since 1941. The facts are there, and it is time the boaters realize that they do not own the land or the property or the water; they are renters and nothing more than that. The state could simply fill in the harbor, just like it did at Ala Moana Park many moons ago. If it did that, the land would be worth 100,000 times more. It's time to face the facts about Kewalo Basin. Gut it and clean it up for all the people of Hawaii, not just the boaters. HCDA might just make a beautiful project of the harbor in the future. Every July 4 the Hawaii Society of the Sons of the American Revolution sponsors "Let Freedom Ring: The National Bell Ringing Ceremony Celebrating the Independence of the United States of America." In accordance with Congressional Resolution No. 25, bells across the United States are rung 13 times at 2 p.m. EDT in honor of the original 13 states represented by the signers of the Declaration of Independence. Along with the tapping of the Liberty Bell in Philadelphia on Independence Day, there also is a series of related patriotic festivities, which take place in the Independence Hall area, including a colorful parade of Revolutionary War flags, fifes and drums and other entertainment. In Hawaii we ask that bells in homes, businesses, government and religious institutions be rung at 8 a.m.
For more information, please visit www.let-freedom-ring.org or www.hawaiisar.org. I recently visited Oahu for the sixth time, this last time mostly business. On my one free day I rented a car and took the awesome drive east of Waikiki and up to the North Shore. Along the way I noticed stickers on the public signs leaving Waikiki, at Makapuu, Waimanalo, all over Kailua, up Kamehameha Highway (on Kamehameha Day! ), Kahuku, hundreds at Sunset Beach, Waimea and all over Haleiwa. I spent hours taking off stickers when I pulled over. I can't believe how bad it has become. The majority of the stickers are for local surf and clothing companies and radio stations. This urban graffiti spoils the beauty of the islands. I ask you to help remove what you see and please don't add to the problem! We have aggressively pursued this in San Diego; I am proud to say it is not as bad as your problem. With some help on your walks, trips to the beach or bike rides, it can be fixed. Aloha! When flying I always get seated next to the person coughing, sniffing or holding a screaming baby. On a recent trip to Honolulu I was so happy that the seat next to me was open. I was in the aisle seat. It was 30 seconds before the door closed and a standby passenger came on -- the biggest, fattest guy and coughing up a storm. I freaked; not one empty seat, and me, the germaphobe, having to sit next to this guy. On my return, there was one crying baby on the whole flight -- in the seat right behind me. The airlines need to have a baby and child section, so everyone with screaming kids is all together, preferably in the last five rows of the airplane. Why should people with babies and kids get premium seats? It's not fair to the people next to them. There should be another two rows reserved for coughers and people with fevers. They should be required to wear surgical masks, as sick people do in Japan. I plead with the airlines to start a baby/child/sick person section in the last rows of the airplanes. Your baby might be cute to you, but it ain't cute to others. I am writing to complain about the lack of planning and consideration for the public in recent roadwork along Ala Moana Boulevard. On June 16, Ala Moana Boulevard in the vicinity of South Street on the makai side was reduced to one lane of traffic. This caused a horrendous backup of vehicles heading in the Diamond Head direction. Even after the roadwork was completed, the road remained reduced to one lane. The traffic lights were not altered to facilitate this traffic change. There were no signs on the roads coming from the airport to urge drivers to take the freeway or the route through town to travel east. The resulting traffic congestion was intolerable and the planning unacceptable. This cavalier attitude by government and the contractors must cease. Signs must be posted suggesting alternative routes. Traffic lights must be altered to facilitate the flow of traffic. In addition, as I have long urged, the state should erect permanent electronic signs on both street levels leaving the airport to advise motorists of road work, accidents and alternative routes. I am displeased that the University of Hawaii is cancelling the football game next season. I like football games. I live for football and football is my life. Please reconsider. I want the 13th game. What about season ticket holders? They are being cheated.